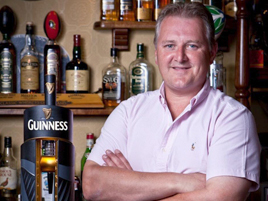 Foleys Bar has been in Cashel for over 40 years. Why not come to Foley’s and watch all major sporting events in our relaxing atmosphere, along with our friendly staff. Enjoy the best Gold Medal Pint of Guinness in our spacious beer garden. Foleys is also the perfect venue to book for all of your special occasions. Sitting next door is The Wine Cellar where you can buy custom made hampers along with a selection of beers, wines and spirits that can be purchased to enjoy at home.